Doughnuts pair well with assorted fried chicken offerings at this diminutive downtown DC spot. Open Mon.-Fri. 7:30 a.m.-5:30 p.m., Sat. 9 a.m.-5 p.m., Sun. 9 a.m.-3 p.m.
About the décor & atmosphere: Perhaps DC’s tiniest eatery --- actually, a miniscule take-out place --- Astro Doughnuts & Fried Chicken emits delicious aromas that float around the space. The restaurant’s interior holds a cashier or two, a mini counter, a rack filled with doughnut trays, and maybe a duo of customers squeezed in. Food: The kitchen fries up loads of chicken, and when your order for a fried chicken sandwich, a fried chicken BLT or pieces of fried chicken (sides, too) is ready, out pops a server with the food wrapped to go. In good weather, look for seating by the front door. 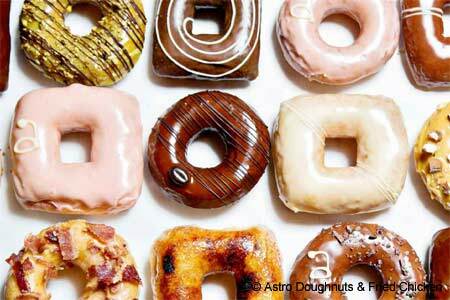 Oh, yes, and don’t forget to pick up several doughnuts. Among the many flavors, one of the top draws must be the maple-glazed, bacon-sprinkled variety.